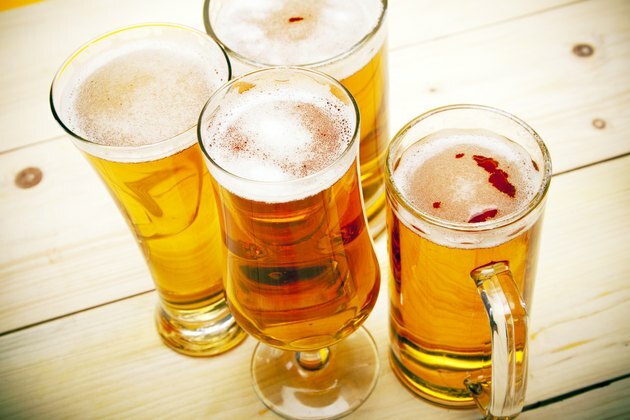 Alcohol-free beer contains fewer calories and carbohydrates than regular beer. Understanding calorie and alcohol content of alcohol-free and nonalcoholic beers enables informed dietary decisions. According to the book "Nutrition for Health, Fitness and Sport" by Melvin H. Williams, 12 ounces of alcohol-free beer contains 48 calories. Beer labeled as nonalcoholic contains 55 calories per 12 ounce serving. Alcohol-free beer contains 0 grams of alcohol while nonalcoholic beer can contain up to 0.5 percent alcohol or 1 gram. Pure alcohol contains 7 calories per gram. Regular beer contains 13 grams of carbohydrates per 12 ounces while alcohol-free and nonalcoholic beer contains 12 grams per 12 ounces. Four ounces of wine contains 4 grams of carbohydrates while light beer contains 7 grams per 12 ounces. The alcohol content in nonalcoholic beer is insignificant. Although some states allow minors to consume nonalcoholic beer, the Indiana Prevention Resource Center at Indiana University notes that the practice may encourage poor drinking habits.